It may seem negligible, but ketchup can sabotage you! Hiding behind it’s pretty red “I’m a vegetable” mask is actually a food that has a fair number of carbs. Let’s look at condiments, some of the common ones. Everybody knows jam and jelly have sugar, so I won’t address those. Just the usual common condiments we eat every day with food. I did NOT use the same measurement for each one, for obvious reasons. You would probably not eat 3 TBS. of mustard, but you could easily have that much mayo with tuna salad, or dipping french fries in either ketchup or mayo (yes, some people prefer mayo to ketchup on fries!). So, here they are. Now, the calories are important, but not NEARLY as important as what happens to your blood sugar and insulin levels after you eat anything. Yes, calories matter, but carbs are the driver behind the steering wheel of your insulin response. More carbs, more insulin. More insulin, more fat storage, more hunger. In order to break the cycle, you must eat less carbs. And you can have an amazing meal of protein and veggies, and think you’re doing great, only to sabotage yourself with Fat Free Dressing and pickle relish! Condiment hacks: Dill Relish, Sugar Free Ketchup, Regular dressing (NOT low fat, see my other post on this here). Best choices? 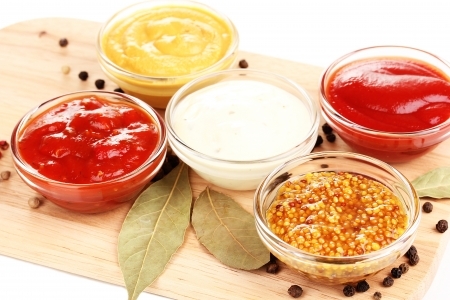 Skip the ketchup, use mustard, make your own dressing or use olive oil and vinegar! At least be informed about what these “invisible calories” are doing to your sugar levels. Oh, one final thing in comparison. Seedless Strawberry Jam (Smuckers, 2 Tablespoons) has a whopping 26 grams of carbs! Want to know your specific brand? Go to Caloriecount.com and check it out!